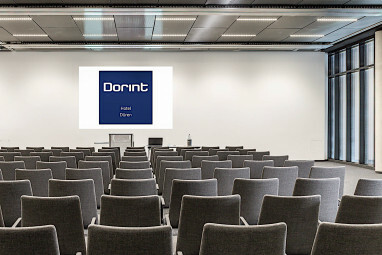 Welcome to the Dorint Hotel Düren! 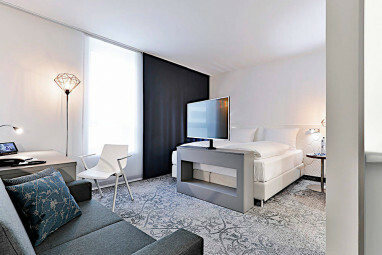 Idyllically situated next to Theodor-Heuss-Park and close to the city centre, railway station and Leopold-Hoesch-Museum, the Bismarck Quarter with its hotel and conference centre is located. The hotel offers 120 comfortably furnished rooms ranging in size from 19 m² to 28 m², some with balconies and a view of the park. 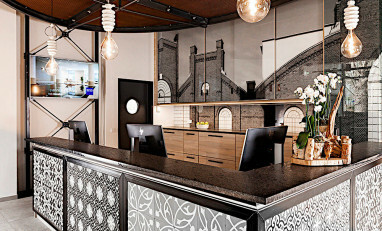 All rooms are equipped with the following amenities: air conditioning, desk/work area, additional seating, telephone, coffee and tea making facilities, W-LAN and a modern, open bathroom concept. The fitness area on the 5th floor is free of charge for our hotel guests. The conference centre with 4 light-flooded and flexibly combinable rooms meets the highest demands for events of all kinds - from conferences and meetings to balls and festive events to private occasions of all kinds. The exciting gastronomy concept in industrial design and with front cooking area, as well as a large summer terrace for the warm months, is an attractive and culinary address at any time of day. On floors 2 to 5 there are 120 elegant hotel rooms (19 m² to 28 m²), equipped with high-quality materials and a modern, open bathroom concept. Each room offers free W-LAN and has the following amenities: Air conditioning, desk/work area, additional seating, telephone and coffee and tea making facilities. 45 “Standard Rooms“ have a size of 19 m² and are equipped with double or twin beds. They are situated on the front or street side and have the following facilities: air conditioning, desk, additional seating, coffee and tea preparation, open bathroom concept (shower and WC with separate door to separate). 51 “Comfort rooms“ have a size of 19 m² and are equipped with double or twin beds. They are located on the quiet side of the courtyard and have the following facilities: air conditioning, desk, additional seating, coffee and tea preparation, open bathroom concept (shower and WC with separate door to separate). 20 “Superior Rooms“ with balcony are more generously cut on an area of 19 m² to 23 m² and are equipped with double or twin beds. They are situated on the quiet side of the park and also have the following facilities: balcony, air conditioning, desk, additional seating, coffee and tea preparation, open bathroom concept (shower and WC with separate door to separate). 2 “Superior Rooms“ family rooms are particularly generously proportioned on an area of 28 m² and are equipped with double or twin beds. An extra bed with an extra bed is also possible. They are located on the quiet courtyard side and also have the following equipment: air conditioning, desk, additional seating, coffee and tea preparation, open bathroom concept (shower and WC with separate door to separate). 1 “Superior Room“ is especially spacious and handicapped accessible on an area of 28 m². It is equipped with a double bed. Situated on the quiet courtyard side, it also has the following facilities: extra hand grips, handicapped accessible equipment with wider doors, air conditioning, desk, additional seating, coffee and tea preparation, handicapped accessible bathroom. 1 “Superior Room“ wheelchair accessible is particularly spaciously cut on an area of 28 m² and is equipped with a double bed. Situated on the quiet courtyard side, it also has the following facilities: extra help handles, wheelchair-accessible equipment with wider doors, air conditioning, desk, additional seating, coffee and tea preparation, wheelchair-accessible bathroom. Enjoy international, regional and seasonal delicacies in our new hotel restaurant “DURON Bar ⋅ Grill“ in the Dorint Hotel Düren. Here not only hotel guests are welcome, but we are also looking forward to spoiling guests from the region with our specialities such as from the wok, from the BBQ grill or even with a Dry Aged culinary. And who knows, maybe our restaurant will remind you of a certain place in Düren? Now we don´t want to tell you too much - see for yourself. In summer you can enjoy the flair of the Bismarck quarter on our terrace and end the evening with a cool drink. 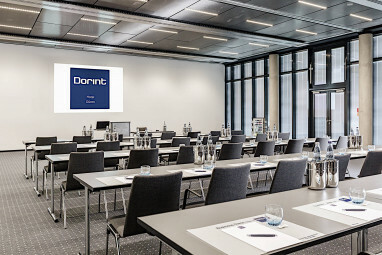 The Dorint Hotel Düren has 4 flexible conference rooms between 88 and 360 m², equipped with high-quality technical equipment. 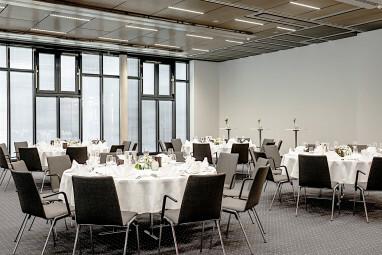 The modern conference area with light-flooded rooms meets the highest demands for events of all kinds - from conferences and meetings to balls and festive events to private occasions of all kinds. The spacious foyer offers space for coffee breaks, lunches but also for all kinds of exhibitions. 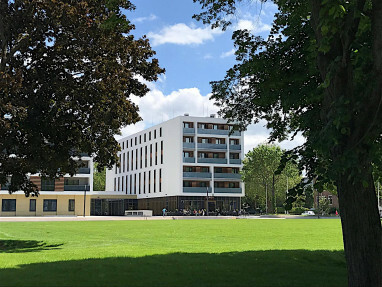 Das Hotel befindet sich in unmittelbarer Nähe zum Stadtzentrum, mit 40 hoteleigenen Tiefgaragen Plätze direkt in der Moltkestraße. Zahlreiche weitere Parkhäuser befinden sich in näherer Umgebung zum Hotel. Die Autobahn A4 in Fahrtrichtung Köln und Aachen erreichen Sie in 5-10 Minuten. Das Hotel befindet sich in unmittelbarer Nähe zum Dürener Bahnhof mit Bahn Anbindung nach Köln und Aachen. Am Bahnhof Düren befindet sich ebenfalls die Rurtalbahn Haltestelle mit Fahrt nach Heimbach und Jülich. Eine Bushaltestelle befindet sich direkt vor dem Hotel in Richtung Vororte Dürens. Direkt am Flughafen befindet sich ein Bahnhof, von dem regelmäßig ICE-Züge, RE-Züge und die S-Bahn-Linie S19, die Sie bis zum Dürener Bahnhof führt. Von dort gehen Sie ca. 5 Minuten bis zum Hotel. Direkt am Flughafen befindet sich ein Bahnhof, von dem regelmäßig ICE-Züge, RE-Züge und S-Bahnen fahren. Mit der Linie RE 1 gelangen Sie direkt über Köln zum Dürener Bahnhof. Von dort gehen Sie ca. 5 Minuten bis zum Hotel.